These turkey patties are very flexible: you can just serve them as is with mash and two veg, or use them as burger patties. 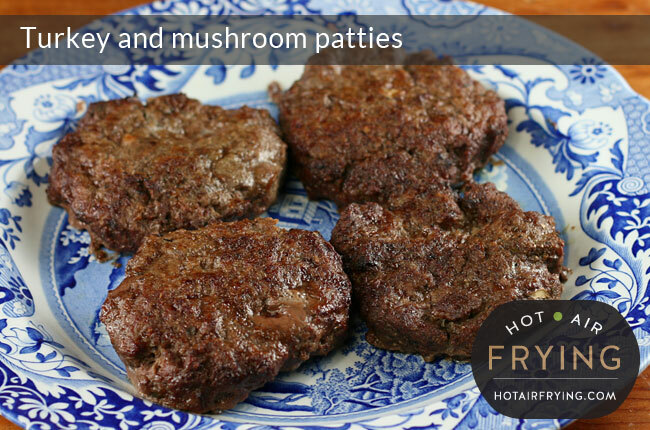 Even though they are made with a lean meat, they are very juicy owing to the mushroom in them and the hot air method of frying used. Juicy, tasty guilt-free nutritious turkey patties. Wash the mushrooms, shake the water off, pop into food processor bowl and purée. Add to the food processor bowl all the seasoning items from the Maggi down to the black pepper, and whiz for another minute. Divide the mixture into five and form into five patties. 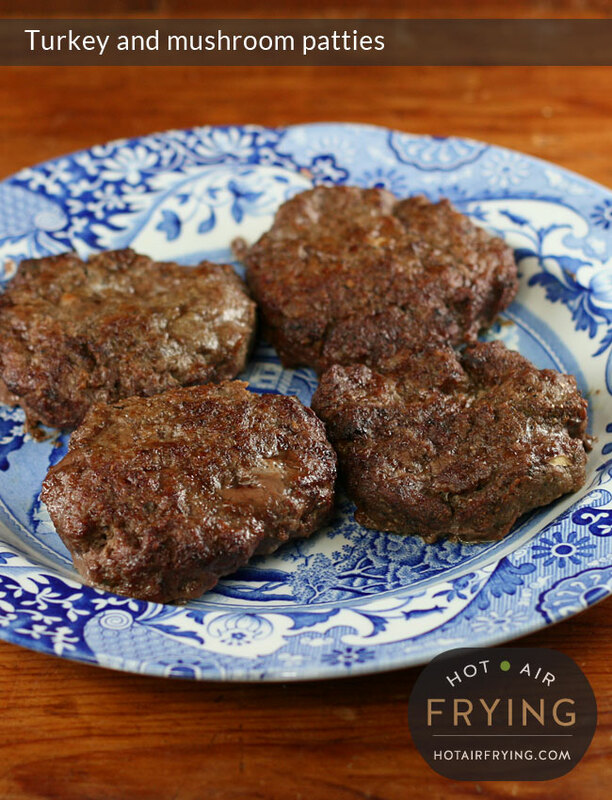 With your thumb, put an indent in the centre of each one to prevent the patties bunching up in the middle. Spray with cooking spray both sides of the patties. Place in basket of hot air fryer. Don't stack them; it is okay if sides touch. Put basket in machine, put temperature to 160 C (320 F) and cook for 10 minutes for medium (or longer to desired degree of doneness.) An instant read meat thermometer should read 75 C (165 F.) There is no need to turn the patties during cooking. You can cook these equally well in an Actifry™ provided you are able to put them on a 2-in-1 tray or on a snacking tray. No need to turn them. Don't attempt to do in the bowl with the paddle in. Instead of Maggi, you could try 1 tablespoon Worcestershire sauce. Instead of turkey, you could use ground chicken. Or lean ground pork, lean ground beef, etc. The recipe is easily doubled or tripled; just cook in batches and keep previous batches on a plate covered with tin foil or a microwave cover. 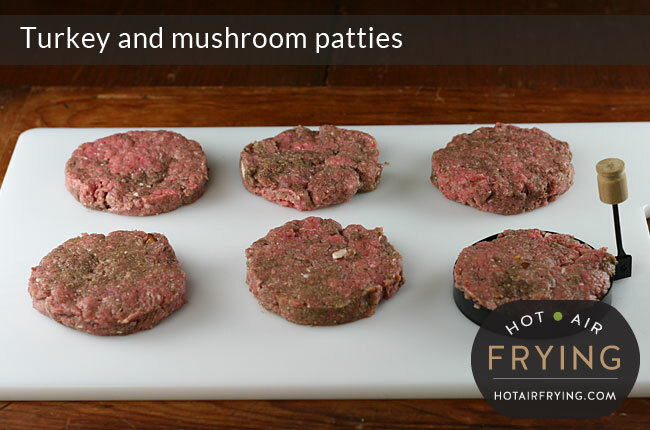 If you use a pound and a bit (around 500 g) of ground meat, then you will get 5 patties. This recipe by the way, is totally healthy. It’s even low in sodium. I just used regular white mushrooms. 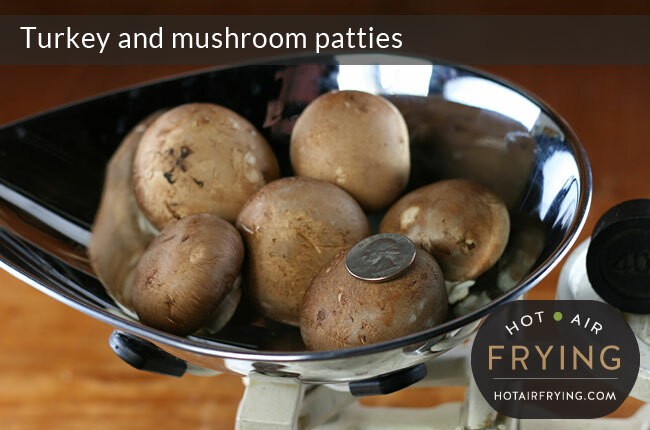 A medium-sized regular mushroom is 30 g / 1 oz, so 6 of those is enough. I puréed the mushroom in the food processor. 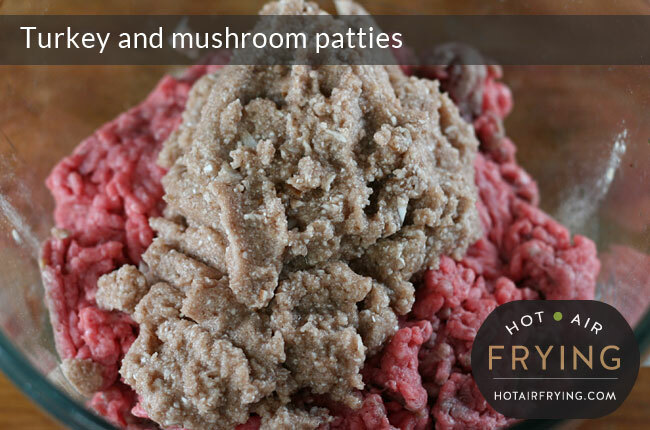 If you don’t have access to a food processor, you could try just mincing the mushroom very finely with a chef’s knife. Forming meat patties with the aid of an egg coral. I use an egg coral to form meat patties into rounds. In fact, it probably gets used more for that than for cooking eggs with. It’s pretty much the perfect width and thickness for patty rounds. Don’t forget to press your thumb into the centre of each patty: that stops it from bunching up in the middle and becoming misshapen. 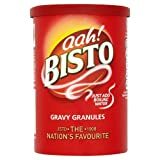 These are lovely with a bit of gravy on them; I’m lazy on a weeknight and just use instant gravy granules that you just mix up with boiling water from the kettle. Makes 5 patties. The odd numbered patty is great for someone’s lunch during the week! 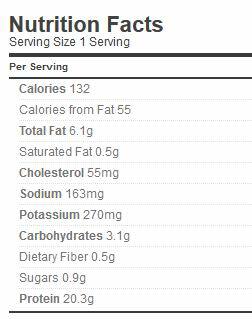 Per patty there are 132 calories. Myself, I am just frying chicken and french fries with the airfryer. You, sir, blew my mind. Will try a few things out. Hope they look just as yours in the photos! lol!